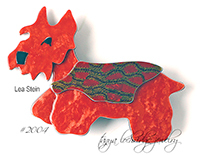 Signed “LEA STEIN PARIS” on the original v-shaped pinback. 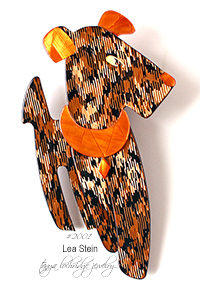 Ric, the Airedale, by Lea Stein Paris is a very collectible guy. 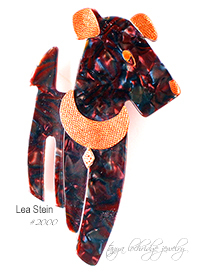 In the 60s, Lea and her husband, a chemist, worked together to create a unique laminated cellulose acetate. 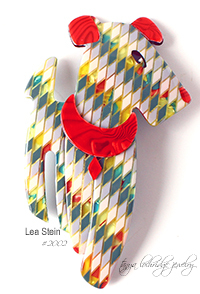 This material could be layered with varying textures and Lea Stein played with lots o colors, interesting textures and patterns in her layered pieces. Each one is unique. I started collecting Ric and Kimdoo shortly after Agatha, my Norwich Terrier came into my life in 1994. Of course, I adored her; and I have really happy memories of my grandpa and airedales in the 50s and 60s. So it was a match made in dog heaven! In the 50s and 60s my brother and I would play with resin, laminated plastic, sawing and polishing all kinds of shapes and sizes for who knows what! Clearly I have a long-running fascination with materials of that type. 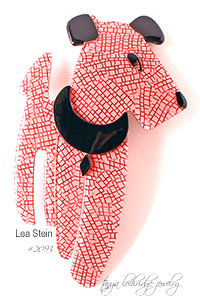 I was living in NYC when I discovered Lea Stein. There was a favorite vintage jewelry seller at the market on 64th and First every Saturday and the majority of my collection came from Paul. I went for the unusual patterns as you’ll see in the few I’ve listed here. 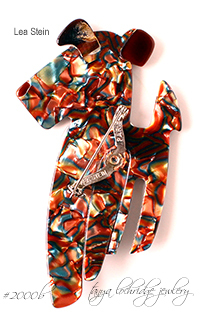 I absolutely love the toss of shapes and colors.